We 3D modelled and lit the entire site, including bar areas, and lounge tent, to get a realistic look at how the site would work. 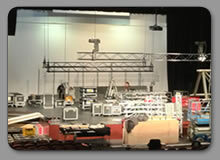 This is one of our touring single systems.Designed to fit under tables or stages, while still having lockable castors. 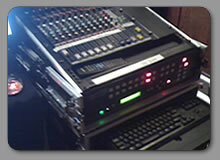 The front and rear lids latch together providing a case to carry to FOH with monitors and keyboards etc. 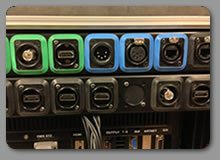 Here is a closeup ofthe patchbay of the 6U single-server shock rack case pictured to the left. Coloured sealing gaskets allow for easy on-site identification. Video Control Systems. 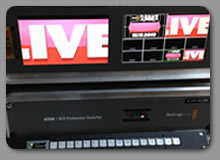 Here is an example of controlling an ATEM 1 M/E production switcher from 16 buttons on a 1U rack strip. 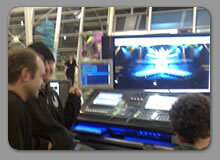 Programming unique lighting and video looks for each of the 63 contestants. The library management features of MediaMaster software allowed for instant cueing of each category winners' visual elements. NoeDo Concept Model. 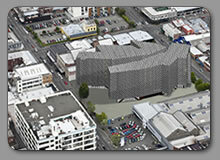 We produced 3D renders and Google Earth real-time video tours to demonstrate this conceptual design. Architectural design by Nick Yardley. Rotorua Wearable Creations 'n Colour Awards. 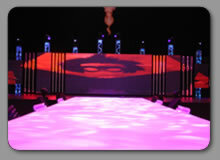 Last-minute colour balancing and quick run through of each contestants video content, this image shows a water themed video loop, just one of the hundreds of HD loops that come standard with our rental systems. Control Rack Example. 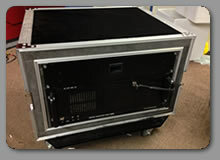 In order to save time onsite we prepare our touring media systems into wheeled rackmount cases with labled patchbays, this allows for a very quick setup. 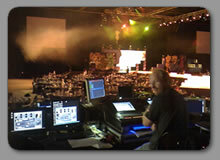 Colour/ brightness balancing of high definition plasma wall and martin stage bar LED fixtures. Rotorua Wearable Creations 'n Colour Awards. 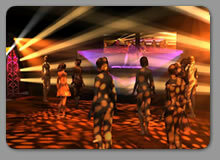 Event pre-visualization using Martin Show Designer. 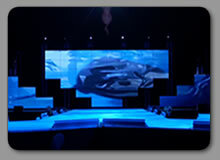 The 50" plasma screen helped contestants decide on their individual lighting and video looks. Pictured- Steve Wilson, and Steve Renwick. NZGT13 Regional Finals. 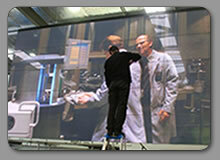 Assembling the 64m2 of high resolution LED screens, a lot of work is put in behind-the-scenes to make these TV shows a reality. Screen Alignment and Cleaning. Five by five PDP wall, twenty-five individual 42" HD plasma screens. Attention to detail is very important to us, a fingerprint or slightly mis-aligned image is unacceptable, even if we are the only ones to notice.